What struck us about this graph, though, was how regular it was, a smooth upward incline into the late 70s, at which point it tails off. Earlier this month, we noted research showing that economically insecure people vote less frequently. There’s clearly overlap between that group and younger people; a common explanation for the high turnout of older voters is that they’re more likely to be economically secure and less likely to move frequently. This graph is a graph of age. Perhaps it’s a graph of other things, too. Even more interesting, the same data shows that this curve is consistent across demographic groups: while white voters turned out at a higher rate than other voters, that same age-dominant curve appears for all groups of voters. The Fix is careful to note that this is just one election in one state, although one large enough and diverse enough to provide clues about similar behavior in other states. Assuming this curve is constant across jurisdictions, the challenge for election officials is to determine how this age-driven demand for voting affects administrative choices; if, for example, older voters prefer traditional polling-place voting, the data suggests that efforts to replace that system will be unpopular with the largest cohort of voters. That said, if newer approaches like early voting, vote centers and wider vote-by-mail are indeed more convenient for middle-aged and younger voters, those systems will someday be “the way we’ve always done it” for tomorrow’s high-propensity voters. I’d love to know if anyone in another state has similar data; it could go a long way toward helping the field get a better sense of what to expect from its “customer base” in the electorate. 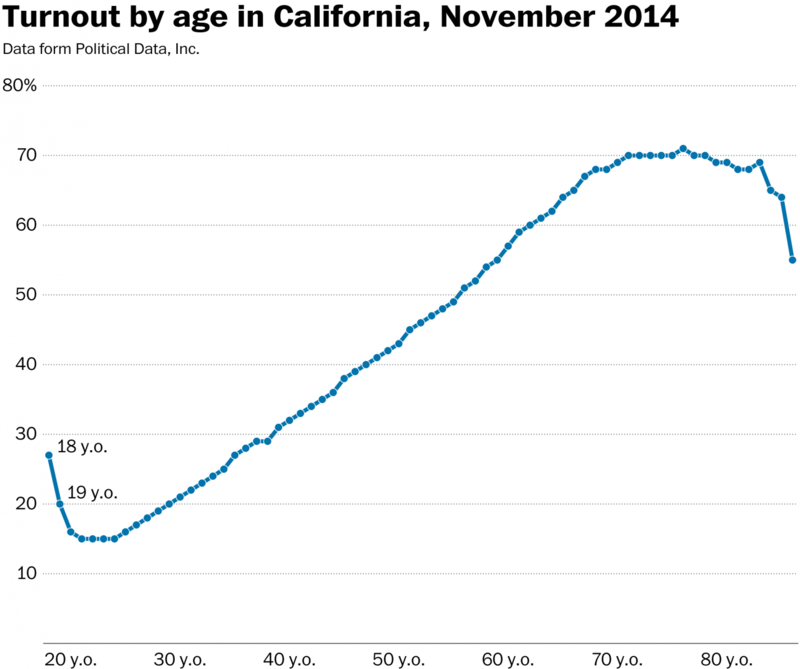 1 Comment on "California’s “Remarkable” Turnout Curve Shows Effect of Age on Participation"